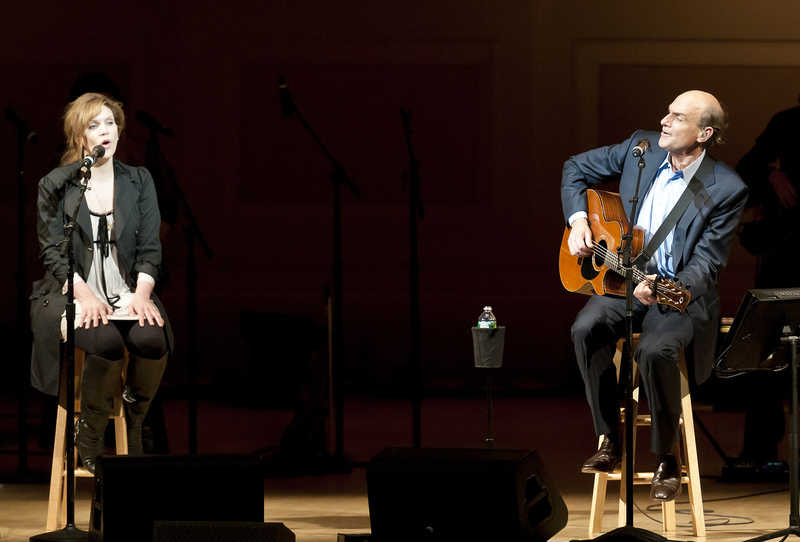 On Wednesday, I got the chance to see Alison Krauss and other join James Taylor on stage at Carnegie Hall for his Roots performance within a series of performances at the Mecca of venues. Taylor was decked out in a suit, looking very Carnegie. He was joined by Jerry Douglas for most of the night and even invited Douglas to take the lead on vocals with a great bluegrass rendition of Jimi’s “Hey Joe”. Taylor introduced Krauss as “the best singer ever.” While she gave a bit of a bashful response (how could she not? ), he seemed to actually believe that. Krauss took the vocals for three songs, including “Someday Soon”, which was my favorite song of the night (here’s a very rough recording I found on YouTube from some guy that was basically recording the entire show). She also performed “Never, Never Land” from Peter Pan, which showed off how amazing her vocals are, but wouldn’t have been my first choice, and “How’s The World Treating You,” the Louvin Brothers song the two recorded together (see previous recording below). As expected, she kind of stole the show (for the moment). Overall the show was definitely a James Taylor show. He sang the big hits. I wouldn’t say that I’m a JT fan, but I was really impressed at how good of a musician he is and how excited he seemed to be playing songs that he’s played for so long (he mentioned he’s been touring for 40 years). I feel like his market is “play a song that people will walk away from and think, ‘ohhh what a beautiful song.’” But in reality, I think he’d rather be playing something more fun (another reason this show was special). His band was great and even included fiddler Andrea Zonn, who was in Union Station before Krauss joined the group and grew up in the same circles and playing the same festivals in Champagne, IL. Robert Cray also played a few blues tunes and was really amazing. Danny Kortchmar, Taylor’s partner from very early days, was also pretty impressive. Amy Grant and Vince Gill were also supposed to be there, but had an illness in the family. SO, they were replaced by Tony Bennett, who came out and sang “Put On A Happy Face” with James. The place went NUTS. With one song (that even had a few rough moments, but still flanked by standing ovations) Tony stole the show from Alison (and James). He’s a badass. Here’s a great and more reputable review of the show from CMT. forget it, can’t imagine the experience when it includes JT.